WELCOME! 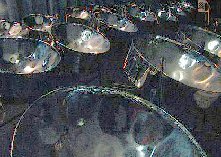 to your one-stop steel pan (steel drums) information site! Whether you are new, an experienced pannist or simply curious about the instrument, this site is a great place to find valuable and relevant information. Facts about this new musical instrument can be hard to find. There are only a few online sources of information. As a music educator and performer, I have been asked on countless occasions for information on all aspects of the instrument. This site is my response. It includes answers to the most frequently asked questions and also provides some additional tips. No matter your level of experience, I'm sure you will find information to help your playing or appreciation of this fascinating instrument. WHAT IS A STEEL PAN (STEEL DRUM)? They are musical instruments created in the Caribbean island republic of Trinidad and Tobago in the 1930’s. They belong to the percussion family of instruments (instruments that are struck or shaken), are made from 55 gallon (oil) drums and come in a variety of musical ranges. When played collectively, they are called a steelband (steel drum band) and persons who play them are called pannists. ARE THEY STEEL PANS OR STEEL DRUMS? Both terms are used to describe the same instrument. This may seem confusing but it is an accepted inconsistency in the steelband (steel drum band) world. The development of this instrument was very informal and involved many persons working independently of each other. This led to the same or very similar instruments having different names. Significant progress has been made in the standardization of the instrument but some inconsistencies still remain. The most popular name for the instrument is 'steel pans' or 'pans' for short. It is the name used in the Caribbean and in academic circles. The name 'steel drums' is not as popular and is used mostly in the United States of America. So… is it a 'steel pan' or a 'steel drum'? You decide. I hope you find this site useful. I welcome your feedback.